Ever worried about missing your stop while on public transport due to falling asleep? 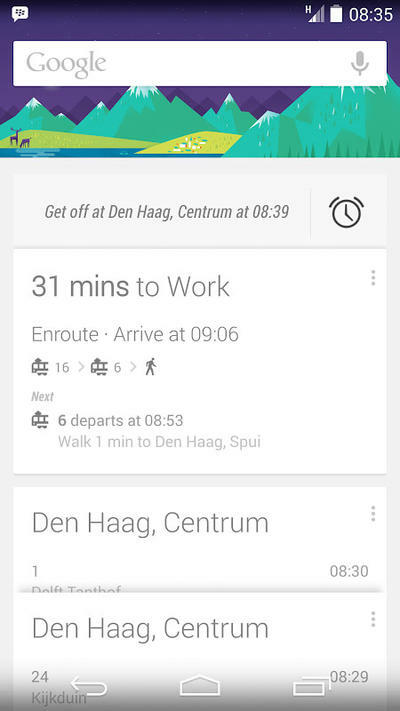 Google Now is here to help! Google is constantly updating its Google Now assistant, and the latest addition may be one of the most helpful yet. If you've ever traveled by public transport – especially trains – you know how easy it is to doze off. There's nothing more infuriating waking up a couple stops down the line from your intended destination and then having to backtrack to get there. All of that has been solved now by using Google Now on Android devices. Simply open up the app when on public transit and tap the alarm to activate it, and tap again if you wish to turn it off. It will alert you shortly before your stop to make sure you get off in time to make your connection or reach your destination. It doesn't appear to have rolled out to all locations yet, and Android Police notes the picture you see above is from the Netherlands. Having fallen asleep on a train from Manchester to London once and waking up as it had already come to a complete stop at Kings Cross was enough to make me a fan of this idea. Hopefully Google will roll this out in more areas soon.